About two or three years ago I saw a stackable planter in one of my Mom’s garden magazines and we worked to recreate one for my garden. 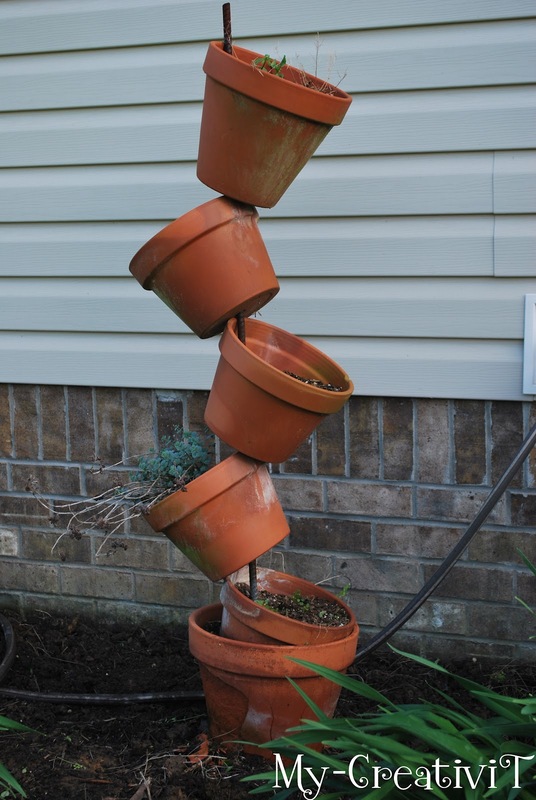 After seeing some really cute painted terracotta pots I decided it was time to remake my tipsy stackable pot planter. As you will see in the before picture some of my pots were broken and needed replacing. 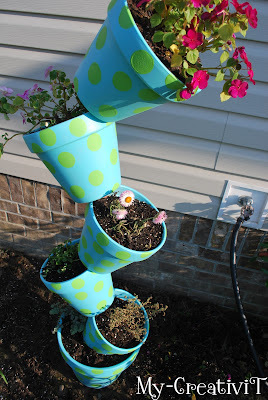 This is a really fun project and adds a focal point in your garden so I thought I would give you a tutorial. This is a project you can make all your own depending on the colors you want to use and you can even make this on a smaller scale depending on the size of your garden. · First you will want to apply polyurethane to the inside of the pots to help protect them. 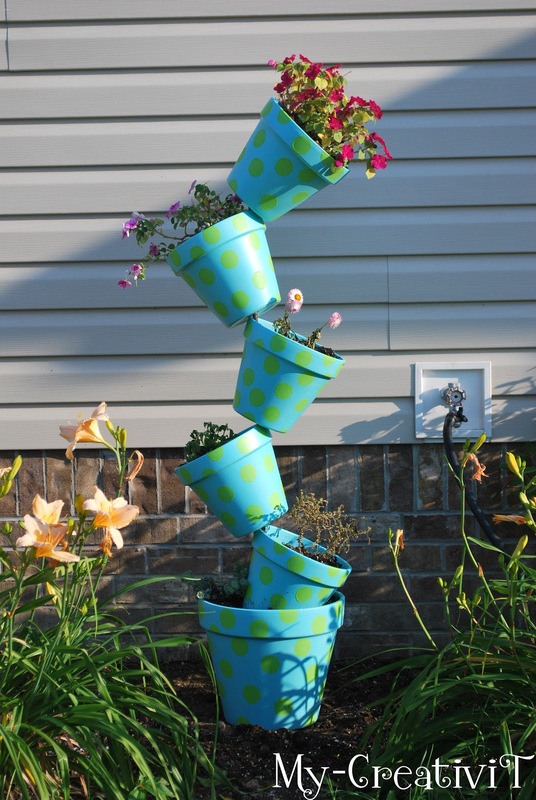 · Apply your base color to all of your pots. I painted the inside rim of my pots about 1” inside the pot since the top of the pot is visible and I also painted the bottom of my 10” pots because you can see them as well. o I thought it would be smart to put a “primer” on my pots since I had read that terracotta soaks in paint – depending on the color you use I would skip this step. My pots have a “primer” color and three coats of Pool paint. Had I not used a lighter color “primer” I could have probably painted just two coats. · Once the base color has dried have fun adding polka dots or whatever design you decide to paint. I used the largest pouncer for the 14” pot and the next size down for my 10” pots. · After your pots have tried spray at least two coats of the Valspar sealer – remember to spray the rim, the inside where you painted and the bottom of your pots as this helps to seal the pot and protect your paint. 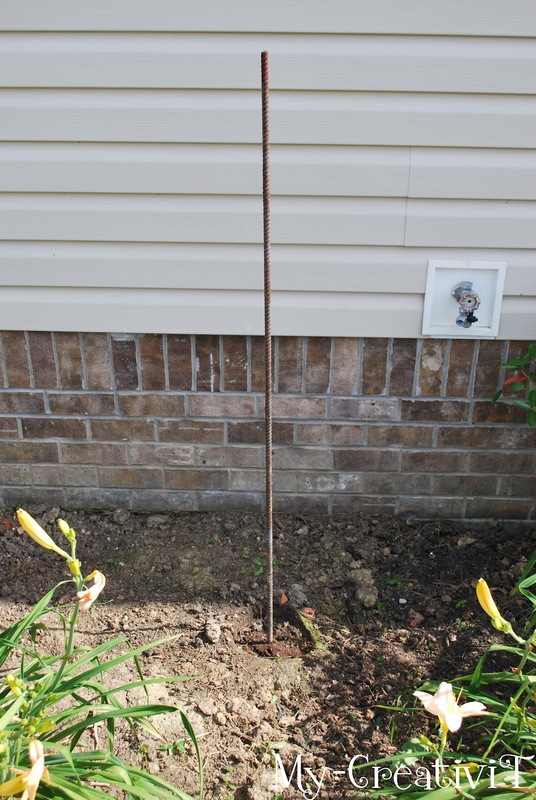 · Slide your next 10” pot and lean it in the opposite direction – it will be supported by the previous pot and make sure the top of the pot is resting on the metal rod. Fill the pot with dirt and your desired plant. Continue this step alternating sides until you reach the top. 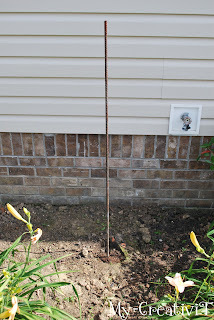 Here are the before and after pictures – as you can see I needed new pots and I love the extra color in my garden. This was my weekend project – what did you work on or plan to make this weekend? CUTE, Tracey! I love the update. The bright colors are just what the pots needed! Thank you for visiting my blog and for taking the time to leave a comment. I read and respond to each comment as I believe it is a great way for us to share our craftiness. Please note if your profile is set to "no reply" I will be unable to reply to your comment via email. 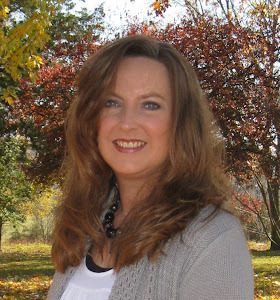 Hello and thank you for stoping by my blog. Through this blog I hope we can inspire each other to be creative!